The calendar says Winter doesn’t start until December 21. I guess the joke is on us. On the way back from errands yesterday, I decided to head downtown and see how the water was flowing over the falls and under the mill. It’s rockin’ and rollin’ with plenty of snow piled nearby. I couldn’t get any closer because they have it fenced off because of work needing to be done to reinforce the sides. We moved about 6″ of snow on Thursday, then what was left on the ground melted a little and turned to ice. Snow, I do okay with, but ice not so much. So, with my Yaktrax strapped on, the long handle ice scraper, snow pusher and I spent about an hour getting it all cleaned up. Now, there’s more snow in the forecast. If you have a two -stage snow blower that you are satisfied with, please drop me a comment. I’m shopping. I know I don’t want an electric cord to deal with because the area is too large, and I’ve tried a single cycle, and it won’t go on the ground where we need paths to the chickens and ducks. This entry was posted in New England and tagged Ice, Mother Nature, Snow, Snow blower, Thanksgiving, Winter, Yaktrax. Bookmark the permalink. Whaaaaaaat??? Is all I could think. Apparently after 5 years Cincinnati, I forgot what tricks Mr. Winter can play on you (as much as I love the cold and snow..but limited to December to the end of February thank you very much) In Canada after 5 years of enthusiastically removing snow with shovel, yodeling words like invigorating and good excersize, we gave in on the 6th winter that started in October with 5 feet of wet lumpy snow. We splashed the cash and bought a delightful gas engined heavy snowblower with lights, several programs and what nots and it seemed to us, he almost did the work by himself. Yodeling “invigorating good excersize’ was solely reserved for snowshoe expeditions again and we never ever regretted it! We asked around for advise at the time, we got the same everywhere :” buy a good one, not a cheap one”…. Yes, winter is here. 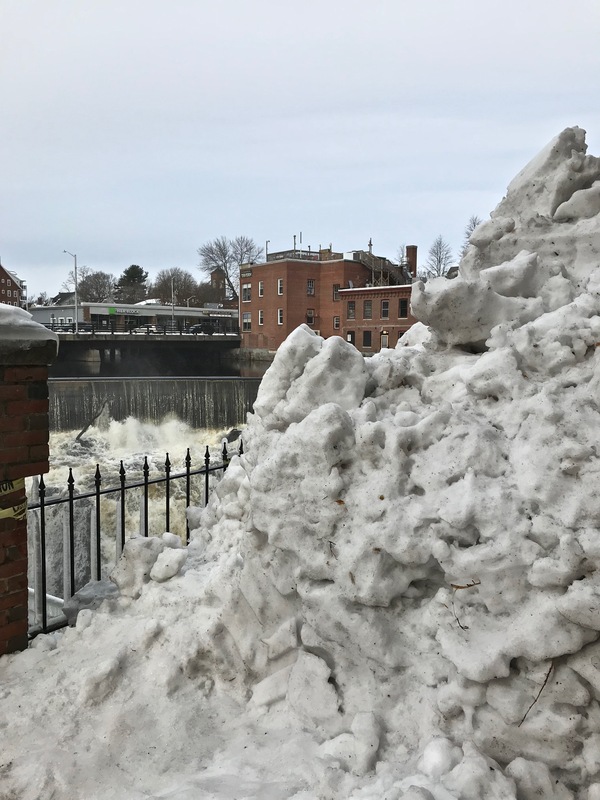 Not so unusual for Maine, although plenty of Mainers are yelping in distress.Good luck with the snowblower, and stay safe on the ice. Clif has already taken Little Green out for a spin. More to come! That first photo is depressing! Hope it’s not an omen of what’s to come. I love the shot of the two frozen leaves. I can’t help you out regarding a snowblower, but I am a firm believer that you get what you pay for. Hopefully you find one that will take care of your needs and won’t require remortgaging the house to pay for it! Lol. Stay safe and warm. And keep your Yatrax close at hand. I’ll answer the question first. I have a Honda snowblower with tracks. I like it because in addition to the north-facing driveway, I have to plow paths to the firewood racks and this thing is great in the yard. The blower mechanism is adjustable on the tracks. In the center of three positions, it’s angled down enough to get under the snow and clear the driveway. In the upper position, it’s angled down sharp, and will get under that crunchy layer at the bottom of those I-didn’d-know-whether-to-be-ice-or-snow storms. In the lower position, the machine floats on the tracks, about an inch or so off the ground. It’s great for the yard, because it goes over tufts of grass and uneven spots and it leaves enough snow so that we don’t have instant mud. Mine is about 4-5 years old, but this is the current model – https://powerequipment.honda.com/snowblowers/models/hss724at-hss724atd – They go up in size from 24″ to 32″ but this was the right size for us. I love the photo of the waterfall. That’s New England at it’s industrial best! Thank you, Dan, for that info. Those tracks make perfect sense, and I wasn’t even aware that there were machines with them. I had been researching the electric/single/two cycle machines but had no idea. I sincerely appreciate this very much. Thank you for taking time from your busy day. You’re welcome, Judy. Hondas are expensive machines, but I’ve been happy with this one. When I bought mine, electric start was not an option, but it starts pretty easily. Same here. Snow is okay, and even respected. Ice, not at all. Unless it’s in a drink. 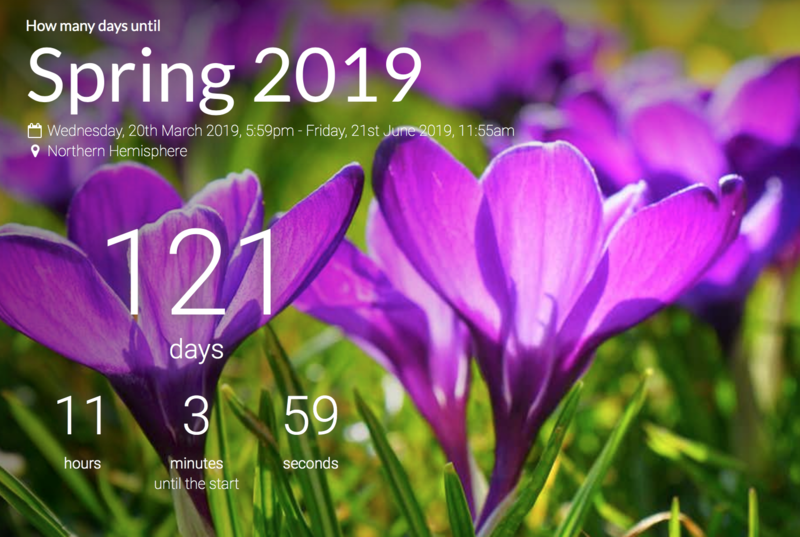 You might have heard me hoot when I got to the crocuses with the spring count-down. Thank you — I needed that! But how else does a gardener maintain sanity? Your winter photos in the middle are beautiful, but that top photo is completely intimidating. As is your account of the ice-chopping. Dear heavens, what a chore! I hope you find the machine that can help you. And I hope you will be very careful. My travel this Thanksgiving has to do with going from kitchen to dining room. More than enough for this old lady! Snow can be beautiful but can really consume your time. Hope you find a useful snowblower so you can spend more time on enjoyable projects. We have a huge and very effective snow blower, but it is so big and heavy, we can’t use it anymore. Garry does the front walk and I help when I can, but the big long driveway is for a plow. We are definitely past the shoveling time. Just seems way too early for a blast of winter, the likes of what you just experienced! We’ve had cold and sprinklings of snow, but nothing sticking yet. I love your pictures, though. Something very haunting about the two leaves trapped beneath a sheet of ice…. It’s predicted to be a cold winter this season. It’s colder here too, but with all the ash in the air, the warmth of the sun when it does shine isn’t getting through to warm it up enough for me, and only one teenie tiny sunspot which is decaying isn’t promising for warm solar winds heading our way either. The red berries and fallen leaves in the snow are so lovely! I hope you find a snow blower you like a lot soon! I certainly hope the weather/fires settle down for you soon. Snow is bad, but I can’t even imagine fire and smoke. Take care, stay safe. I can’t even imagine having to deal with all that snow, or any snow at all. We’ve had such a mild spring and even got some very welcome rain. At last my roses are blooming. Stay warm and be careful on the ice! I love snow, but can do without ice unless decorating plants for a photo. 😉. We’ve only had a tiny bit of snow twice, but Chicago gets much less snow than we did in Cleveland’s snow belt, so much less that we don’t have a snowblower here at all. It does get cold, though. Have a happy and non-icy Thanksgiving. We’re home alone, so it will be quiet and relaxing. Both girls and our new son-in-law will be home for Christmas, though, and I do want snow then. Happy Thanksgiving Sweet friend! Hope you find your Snow Blower! Six inches already. We still haven’t had a stuck snows yet. Sigh. I do not like the icing. Well, I do on days I can stay home and smile at it out the window, when it’s all pretty and stuff, but eventually, one must leave the house and do the things and that’s scary business. We had that ice storm last week and I had to just let my dog run out the door and hope she’d go to the yard, because it was way too slippery and fast for those of us with two legs, no fur, no claws! Your pictures are so lovely — I am the jealous! We have a Simplicity 1080S 10HP snowblower that we have been happy with. It started right up on Thurs. Our mechanic recommended it as we needed it to be powerful and it sure is. My spouse takes in over the lawn to make a run for the dog. I think the key is good tires and a big engine. Good luck with al that snow & ice Judy … I don’t envy you that! Have a lovely Thanksgiving holiday & hope you have time for a little reading too. I do not miss that winter weather. I guess I won’t complain that today will only be a high of 68 with a sky covered in clouds. The snow is pretty to look at and there are times I miss the beauty it can offer, but then I remember the realities and don’t miss it at all. Stay warm and wishing you a happy Thanksgiving. No advice from me. The snowblower ads on tv make them all look grand. Happy Thanksgiving to you and yours! 121 days sounds like a long time . . . That storm was a big surprise–we got about a foot of snow! And more today, plus such cold! Where would we be without our beloved Yaktrax?? Loved to have stumbled upon your blog. I live in New England too 🙂 and yes always counting the days until spring (especially because I spent half my life in the Caribbean!) though I do have to say I really try to embrace the beauty of winter every year 🙂 Traveling to Main for Thanksgiving brrrrrrrrr snow! Happy Thanksgiving! Here’s one for you! Not sure if the link copied over correctly. That’s a lot of snow! Not something we get much of in Savannah, Georgia. Though last January we did get a bit. Yeah!